Jordan Shea Rashad Norwood (born September 29, 1986) is a Filipino American football player wide receiver and punt returner for the Denver Broncos of the National Football League (NFL). He was signed by the Browns as an undrafted free agent in 2009. He played college football at Penn State. Norwood has also been a member of the Philadelphia Eagles, Tampa Bay Buccaneers and Denver Broncos. Norwood is the son of Baylor assistant head coach and former Penn State secondary coach Brian Norwood. 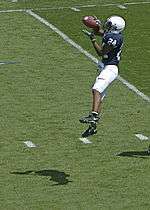 Jordan Norwood during his tenure at Penn State. Norwood was lightly recruited out of State College Area High School. He received few scholarship offers and accepted Penn State's last minute offer over an offer from Bucknell to play football and basketball. It was his leadership and jumping skills on the basketball court that led coach Joe Paterno to offer him a football scholarship. In 2005, his freshman season, Norwood caught 32 passes for 422 yards with a 13.2 yard average. Norwood's sophomore season concluded with him making the Dean's List and being named to the Academic All-Big Ten team. He caught 45 passes for 472 yards and 2 touchdowns with a 10.5 yard average. He joined the basketball team under Ed DeChellis in January, practicing regularly and appearing in four games as a reserve guard in his only season playing basketball. In his junior season, Jordan caught 40 balls for 484 yards and 5 touchdowns with a 12.1 yard average including catching a touchdown pass lying down on the ground versus Buffalo. He had a season high 8 catches for 65 yards and a touchdown in a 36-31 win over Indiana. Norwood earned all-Big Ten honorable mention honors as a senior, after catching 41 passes for 637 yards and six touchdowns. Norwood's eight-catch, 116-yard performance versus Oregon State on September 6, 2008 moved him past O. J. McDuffie into third place on Penn State’s career reception list. Afterward, he was congratulated in person by McDuffie, who attended the game. Norwood had a second consecutive 100 plus yard game on September 13, 2008 against the Syracuse Orange. He had 5 receptions for 113 yards and two touchdowns. Before the game against Illinois, Norwood injured his hamstring and didn't participate against the Illini and the Boilermakers. Norwood was invited to the 2009 NFL Scouting Combine where he measured a 38-inch vertical jump (sixth among wide receivers at the combine), ran 6.80 in the 3 cone drill (ninth among wide receivers at the combine), and 4.20 in the 20 yard shuttle (ninth among wide receivers at the combine). After being undrafted in the 2009 NFL Draft, Norwood signed with the Cleveland Browns as an undrafted free agent on May 1, 2009. He was waived by the Browns during final roster cuts on September 5, 2009. On September 23, 2009, Norwood was signed to the Philadelphia Eagles practice squad. He was promoted to the active roster on December 1, 2009. He was waived on December 7. On December 9, he was re-signed to their practice squad. He was re-signed to a three-year contract on January 11, 2010. On March 18, Norwood changed his number from 84 to 19 after Hank Baskett was re-signed by the Eagles and took number 84 back. Norwood was waived on September 4. Norwood was signed to the Cleveland Browns' practice squad on September 6, 2010. He was promoted to the active roster before Week 13 of the 2010 season. He was waived on August 25, 2013. On August 28, 2013, Norwood signed with the Buccaneers. On August 31, 2013, he was cut by the Buccaneers. Norwood signed with the Denver Broncos during the 2014 offseason. The Broncos placed Norwood on injured reserve on August 25, 2014 after he tore his ACL. In Super Bowl 50, Norwood set a Super Bowl record for the longest punt return at 62 yards. The return set up a field goal that put the Broncos up 13-7. The Broncos beat the Carolina Panthers 24-10 to give Norwood his first Super Bowl win. On March 23, 2016, Norwood signed a one-year contract with the Denver Broncos after drawing interest from the New York Jets and Detroit Lions. Norwood earned a Bachelor of Arts in Advertising/Public Relations from Penn State in 2008. Jordan has two younger brothers, Zaccariah and Levi, a younger sister Brianna, and an older brother, Gabe, who is a former member of the George Mason University basketball team that advanced to the 2006 NCAA Final Four and is currently playing for the Philippine National basketball team, Gilas Pilipinas, and the Rain or Shine Elasto Painters in the Philippine Basketball Association. Levi played football for Baylor University. Jordan was married on June 20, 2015 to Aleah Tebben. They had their first child, a girl named Franni Grace, on November 4, 2015. 1 2 3 "24 Jordan Norwood". Pennsylvania State University. Retrieved 2008-09-10. ↑ Bob Flounders. "Prelude to a blowout". PennLive.com. Retrieved 2008-09-10. ↑ Neil Rudel. "Receivers' success is no passing fancy". Altoona Mirror. Retrieved 2008-09-14. ↑ "44 Jordan Norwood". Pennsylvania State University. Retrieved 2008-09-10. ↑ Vinny Pezzimenti. "Norwood becomes man in the clutch". Centre Daily Times. Retrieved 2008-09-10. ↑ "2009 NFL Scouting Combine: Top Performers". National Football League. Retrieved 2009-02-23. ↑ Thomas, Eric (2007-04-27). "Ware finding his way with weight, Four Lions drafted on Sunday". The Sentinel. ↑ "Jordan Norwood signed to Eagles' practice squad". PennLive.com. Retrieved 2009-09-23. ↑ Spadaro, Dave (December 7, 2009). "Eagles Release WR Norwood". PhiladelphiaEagles.com. Retrieved 2009-12-07. ↑ McPherson, Chris (January 11, 2010). "WRs Norwood, Collins Inked To New Deals". PhiladelphiaEagles.com. Retrieved 2010-01-11. ↑ "Bucs Trim Roster to 53 for Regular Season". Buccaneers.com. August 31, 2013. Retrieved September 5, 2013. ↑ Denver Broncos on Twitter: The Broncos today waived DT Cody Larsen and placed WR Jordan Norwood on IR to get to the league mandated 75-player roster limit. ↑ "Jordan Norwood sets Super Bowl record with 61-yard punt return". www.denverbroncos.com. Retrieved 2016-04-06. ↑ TEGNA. "Denver Broncos bring back Jordan Norwood". KUSA. Retrieved 2016-04-06.